Sick of the same old boring electronics colors? Personalize all of your gadgets with DecalGirl, online at DecalGirl.com. At DecalGirl, you can personalize your laptop, cell phone, PDA, eReader, iPod, gaming devices, and more! With over 1800 designs to choose from including sealife, art deco, flowers, fantasy, and scenery, you’re sure to find something that suits your style. DecalGirl also offers a wide selection of screen armor to protect you precious gadgets. Be a bit unique with a new decal from DecalGirl.com. Be a savvy shopper by checking out RetailSteal.com for the best DecalGirl coupon codes, DecalGirl promotions, and DecalGirl savings. Allow 1-11 business days for domestic delivery depending on what option you choose, and 4-6 days for international shipments. DecalGirl allows returns on any unused items within 30 days of purchase for a full refund. Click our link to head over to DecalGirl today and enter our coupon code at checkout to save 20% on all merchandise. Use the coupon code and save 15% on any order online at DecalGirl. Click link to save. Enjoy a 20% discount on Iphone 5 Skins from DecalGirl with the use of this coupon code. Click to save. 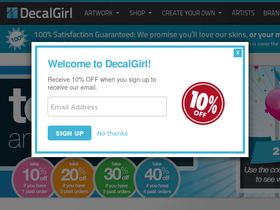 Use this limited time coupon code on DecalGirl and save $15 on skins purchases over $100. Click to save. Click this link to save up to 10% on iPhone covers from DecalGirl. Enjoy 10% off skins for LG Mobile Phones at DecalGirl. Just click here and use this coupon code to save. Save 10% on MacBook Skins using the coupon code online at DecalGirl. Click link to save. Shop DecalGirl and get $2 shipping. Click link to shop now. Enjoy a $10 discount on your entire order from DecalGirl when you use this coupon code online on orders of $100 or more. Click to save. Save 20% on your next DecalGirl order when you sign up for their email newsletter!